The IHOP Colorado Omelet is a great meaty omelet. It is so big, that when I go into to order the IHOP Colorado Omelet that I like to split it with another person. What makes the IHOP Colorado Omelet so special is that it is simply filled with all sorts of meats. You can substitute deli roast beef in a bind. The IHOP Colorado Omelet is so hearty you will be able to serve it as breakfast or even as a dinner. This IHOP copycat recipe for the Colorado Omelette is full of meat. In a saucepan on medium-low heat melt butter and add onions and bell peppers. Stir until onions and pepper are soft but not browned. Add diced ham and stir until the ham is limp and heated through. Immediately remove from heat and set aside. In a mixing bowl add eggs, water, and salt beat and stir well. Set aside. Heat a 12" fry pan on medium-low heat, add a little oil (1 teaspoon.) or spray with a nonstick vegetable spray. A nonstick pan works great. Place egg mixture in pan and sprinkle with onions, bell pepper, ham, tomato if you wish, sausage, bacon, and 1/2 of the roast beef, and 1/2 cup of the shredded cheese. Place a lid on until omelet starts to set. Immediately remove lid and fold omelet from the sides to the middle. If this is difficult fold in half. sprinkle with the rest of cheese and roast beef. Serve with a side order of Picante Sauce or Sour Cream with a little diced green onion. I love their country omelette! COUNTRY IS ALWAYS GREAT, INCLUDING COUNTRY MUSIC!!!!!!!!! HEE HAW.. 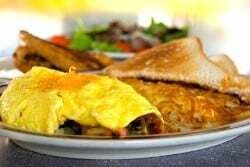 I never seen them put pancake batter in the omelet when they cook for customers. I have been there for a year now. That is ridiculous. If you want to know the secret on how IHOP makes such great fluffy omelettes… They add buttermilk pancake batter to the eggs and make a seperate omelette batter. 1gallon of eggs with 1 pint of pancake batter, or for a single 3 egg omelette, about 2 table spoons. Mix throughly and make a very fluffy omelette. It’s listed on their menu…. I am not sure if i believe you. I would be able to taste the pancake batter inside the omelette. Pancake batter makes them fluffy, it is the buttermilk!!!! !